I love a clean house. There, I’ve said it. I like walking into my house, breathing in deeply and smelling the pure fresh smell of Amonia nothing. Seriously, there is no odor whatsoever. My windows are practically invisible and, because I’m cheap environmentally aware there is no cleanser involved. Ya’ huh! It’s totally not a typo. I just found out the most amazing thing, microfiber. You can get microfiber rags at auto supply stores in really dull shades of grey, red or beige. Microfiber is already adored by green moms who use cloth diapers. You can also pick them up at specialty Grocery stores like Whole Foods or Trader Joes for a little more cash but it much more appealing colors. Jeff thinks everyone should tuck a towel in their pocket (rumor has it that Jeff wears cargo pants). Like me, you will come to adore microfiber. I know you’re tut-tutting and clacking your tongue and thinking, Shaddup Jessica, go back to the 50’s real women don’t care about glistening windows. Yes, you do care, you just don’t want to do the work. Check this out. To clean with microfiber you simply take a cloth, dip it in water (warm if you like), wring it out and wipe the surface until it sparkles. There isn’t an obscene amount of elbow grease required either. I use microfiber on windows, stainless, mirrors, wood shutters and doorknobs with absolutely no cleanser. Unlike paper towels, guess how many times you buy microfiber cloths? Once! Every year or so, I buy a new batch of a dozen. 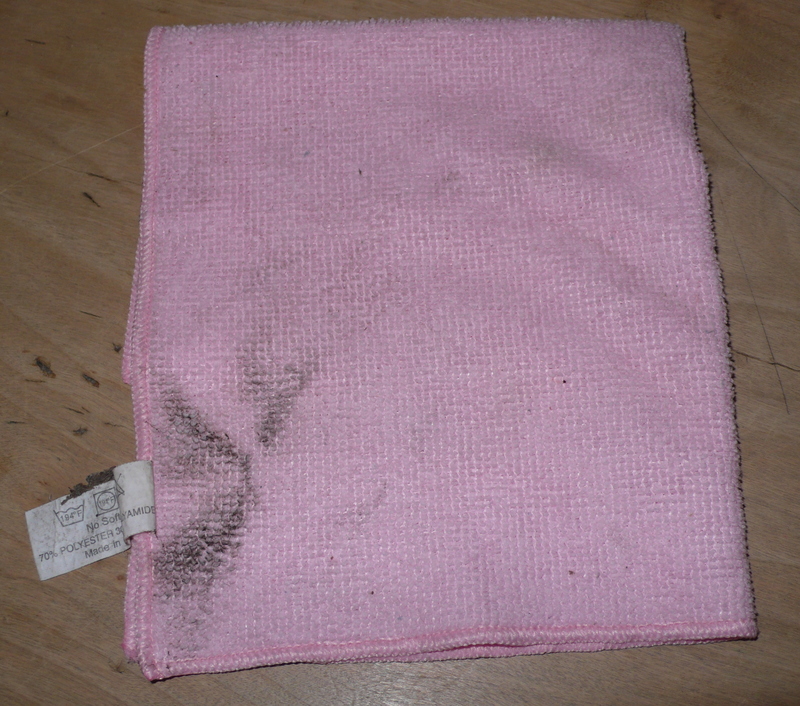 When you’re done cleaning you take the grimy towel and toss it in the washer or just rinse it with more warm water. I realize that there’s more to child rearing than bug picking and window washing. How cool is it that I’ve started my tenure here with all the glamorous subjects? Rumor has it that one of the writers here gets to test drive a fab new vacuum. Yeah baby, the cool kids keep a clean green house. Microfiber cloths are wonderful. I started using them to clean the inside of my car (with just water) several years ago. I’ve since expanded to removing wax from my car, and dusting off the inside of my house. They’re very versatile. I’m with you. I love my microfiber. Love! I’ve been using microfiber cloths for a while around the house now, but was introduced to them via Method’s eco-friendly cleaning products. They have different styles of cloth for different surfaces, paired with their cleaning products; for example, I have a very thin one for the granite surfaces in the kitchen, and a thicker one for the stainless steel surfaces.